Jihad TV in Europe:It’s time to shut down Hezbollah and Hamas broadcasts to the Continent. By MARK DUBOWITZ and ROBERTA BONAZZI | From today’s Wall Street Journal Europe. Their propaganda notwithstanding, Hamas and, two years ago, Hezbollah suffered devastating military defeats that may diminish their ability to attack Israel with rocket fire. But these Iranian-backed terrorist organizations are deploying another dangerous weapon in their war against Western democracies — terrorist television stations. 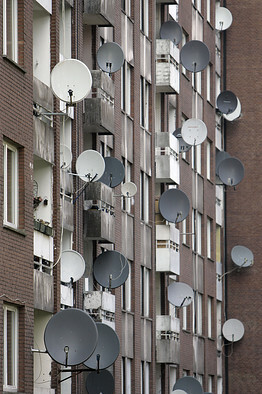 Watching terror programs at your home in Duisburg. Thanks to Arab satellite companies, Hezbollah’s al-Manar and Hamas’s al-Aqsa TV stations can still beam their incitement and hatred into European living rooms, radicalizing Muslim immigrants throughout the Continent. Al-Manar has become alarmingly popular with Europe’s young Arabic-speaking Muslims. On one German television program, young Muslims in Berlin cited al-Manar as a factor influencing their hatred of the U.S. and Jews. In November 2008, Germany banned the terrorist station on the basis that it promoted the use of violence. This ban prohibits al-Manar from doing business in the country, although its hate and incitement are still accessible in Germany via Arabsat and Nilesat. Hamas, designated by both Europe and the U.S. as a terrorist entity, followed al-Manar and took its own brand of jihad to the airwaves in 2006. Today, Hamas’s al-Aqsa television disseminates its violent message on Arabsat. Eutelsat, France’s leading satellite operator and the world’s third-largest satellite company, also began broadcasting al-Aqsa on its Atlantic Bird 4 and Eurobird 2 satellites, enabling Hamas to incite, recruit and raise funds throughout Europe, the Middle East and North Africa. Al-Aqsa TV is notorious for its uninterrupted speeches of Hamas leaders calling for suicide bombings, for its youth-oriented music videos that incite viewers to murder, and programs aimed at children which glorify suicide bombers. Faced with world-wide outcry for using Disney-like characters, the show’s producers dropped the Mickey Mouse character — they told kids that Israel had killed the popular rodent — and found bees, bunnies and other animals to tout the virtues of jihad. Another broadcast shows mothers donning suicide belts and calling on women and girls to blow themselves up. The “martyrs” are assured that the “Zionist Entity” will be destroyed. Al-Aqsa is an integral part of Hamas’s global strategy of radicalizing Muslims, subverting the peace process, raising funds for future attacks, and disseminating propaganda in the Palestinian territories and beyond. Like al-Manar, it is an operational weapon in the hands of a deadly terrorist organization. While “free speech” activists decry action against these terrorist media outlets, European officials should recall prior campaigns against enemy media outlets. In 1999, during the Kosovo war, NATO planes bombed the Belgrade-based headquarters of Radio Television of Serbia. While 16 employees were killed, NATO defended the action as a legitimate attack against Serbian broadcasting of Slobodan Milosevic’s violent call to arms against Kosovo’s Muslims. Europe can act against Hamas TV under its own legal authority governing television broadcasting. France should enforce the warning its own audiovisual authority issued on Dec. 2, 2008, warning Eutelsat that al-Aqsa programming violates French communications law. Eutelsat’s recent decision to stop distributing al-Aqsa on only one of its satellites is not sufficient compliance, and Eutelsat should be held accountable for its continued broadcasting of al-Aqsa. In his inaugural address, President Barack Obama called for “a new way forward” with the Muslim world. But he also called for a strong defense against those who “seek to advance their aims by inducing terror and slaughtering innocents” and addressed leaders “who seek to sow conflict, or blame their society’s ills on the West.” Working with Cairo and Riyadh to cease satellite broadcasts of these Iranian-backed, terrorist-owned media channels is key to addressing the radicalization threat in Europe for the continent’s leaders. But France should first get its own terrorist-media house in order.